Dora township began its official career on July 22, 1879, at which time the commissioners granted the request of George W. Smith and others for the creation of a township (township 136, range 41) bearing this name. The signers of the petition asking for the establishment of the township were as follow: William Englemann, George W. Smith, P. M. Smith, E. L. Thomas, Herman Klug, Carl Klug, Julius Raschke, Gottlieb ________, H. G. Doeltz, Jacob Bouer, Anton Honor, Gottlieb _________, Carl Gustav Wagner, Y. S. Powers, Ernest Lubbermann and William Schimelpfinnig. The election of the first officers on the ninth of the following August at the house of David Parks formally marked the beginning of the independent career of the township. Dora is one of the north central townships of Otter Tail county; it is bounded on the north by Candor, on the west by Lida, on the south by Star Lake and on the east by Edna. This township, as is the case with all the townships of the central and western part, truly lies in the lake district of the county. There are twenty-five lakes lying entirely within the limits of his township and eight additional lakes which extend into it. 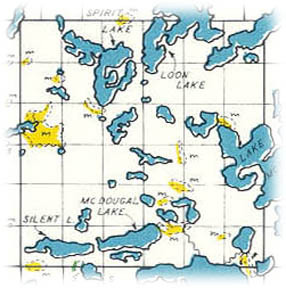 Spirit, Loon, Big McDonald, Silent Lakes and Lake Loon are the five largest lakes in the township. Star Lake also extends into sections 34, 35 and 36 from Star Lake township. There are only two sections, 30 on the west and 12 on the east, which either do not contain a lake or a part of one. Those lakes on the southern and eastern side have an outlet into Star lake and are part of the Red river system. Those on the north are drained through Loon lake and eventually into the Red river, while on through Lakes Lida and Lizzie to the Pelican river. Thus this township is drained in three directions and into two different streams, although they all form part of the Red river drainage system. This township is rather sparsely settled and the farms are large. There has never been a town platted within the limits of this township. For a number of years there were two postoffices located in this township for the accommodation of the settlers so remote from any trading center, but with the advent of the rural routes these have long since been abandoned. These were Dora and Spirit Lake. Spirit Lake. The present township officers are as follow: Supervisors, William Diller, William Albright and Fred Wendt; clerk, Charles Stender; treasurer, Bud Hoffman; assessor, Charles Hoffman; justice, Fred Wendt; constable, William Albright. Places of birth for Dora Township in the 1905 state census.